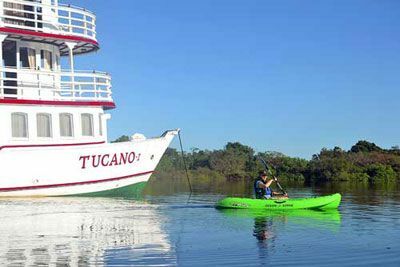 The Motor Yacht Tucano was designed from the very start to be the most sustainable vessel in the Amazon. In addition to a very sophisticated solar energy system, the vessel incorporates a number of design elements and operational practices that significantly minimize our environmental impact and promote sustainability. Some of these features described below are: Dual Water System, Passive Solar Design, Conservation through "Small-Spec" Equipment, Accommodations Best Practices, Waste Management, Sanitation Waste Treatment, and Provisioning. Dual Water Systems - Gravity and Pressure: One very novel aspect of the design of the M/Y Tucano is that it has two completely independent water distribution systems - each with its own independent ship-wide piping. Our primary and sustainable water system is a gravity distribution system. Our gravity system operates without any electrical power at all except a single small pump that can be energized by solar electric energy. All the toilets, sinks, showers, and galley are supplied by this system. The vessel is quiet, capable, and sustainable even with all fossil fuel machines are turned off and when the vessel is at anchor in one of the most pristine natural areas of the planet. This enables the vessel to avoid having generators operating all the time. The secondary shower water system is similar to a conventional marine water system, with diesel engine generated electricity pressurizing a system of pipes and valves. However, as described below, we have also added a number of novel refinements to this system in order to conserve energy. Passive Solar Design: The M/Y Tucano was designed with large opening windows and high density thermal insulation throughout. In this way travelers are able to use natural lighting during the day reducing the need for electricity for illumination. The windows have insect screens so that, if they wish, travelers can open their windows - the fresh blossom scented air is one of the unexpected pleasures of the Amazon. This immediacy and immediacy in experiencing the rainforest is a pleasure that is lost to travelers in the more typical cruise vessel that features staterooms hermetically sealed in climate controlled bubbles. The staterooms and interior public spaces of the vessel are well insulated to conserve energy and enable travelers to be comfortable. Conservation of Energy - Equipment Specification: An essential and often overlooked aspect marine energy conservation is equipment specification. The Motor Yacht Tucano employs a "small spec" policy of specifying all of our engines, the main propulsion, the generators and our launch motors, to be as small as possible while efficiently serving their purposes. This helps conserve fuel and dramatically reduces air polluting emissions. Further, most of the engines are of the newest, most fuel efficient generation with significantly lower hydrocarbon emissions. Our ship's launches, in addition to our solar-electric motors, are provided with small-spec highly efficient four-stroke outboard motors. We find that there is no need to roar through the rainforest at high speed when quiet, less polluting small-size motors get us where we want to go much more ecologically. Small scale in most aspects of expedition travel is by far the most rewarding for travelers and expedition staff alike. Our small-spec imperative suffuses every technical aspect of the vessel. This includes the use of LED lighting vessel-wide, low-pressure water systems, and of, course, the use of solar generated electricity and solar-thermal heating up to the capacity of our arrays. The many large windows in every stateroom and public spaces have all but eliminated the need for electrical illumination during the day. Given that our cruises take place very close to the equator, one of the most demanding of energy uses is air-conditioning. Again, with air-conditioning our small-spec technique is employed to reduce our energy consumption as much as possible. This is accomplished by creating numerous independent cooling zones on the vessel, each with stand alone air-conditioning equipment. This enables us to reduce usage where and when cooling is not needed. This equipment, paired with staff procedures to monitor zone cooling, has reduced our energy consumption very significantly. Waste Management: Inorganic and organic waste from our galley and hotel services are separated on the vessel. There is an enclosed exterior storage area on the vessel for inorganic waste, which on return to our home port is separated into recyclable and non-recyclable categories and taken to municipal processing facilities. Where possible we avoid the use of disposable packaging. We encourage travelers to use washable drinking cups and glasses instead of plastic disposable cups for all beverages, though disposables are available to travelers who prefer them. Our goal for many years has been to make the vessel the most sustainable passenger vessel in the Amazon. It is an ongoing process, but over time The Motor Yacht Tucano has pioneered applications of sustainability technologies like solar-thermal, solar-electric, and biological waste treatment for use in the deep forest exploration. But these major technologies play only a part, there is a host of other mechanisms that remains important to sustainability and suffuses much of the mechanical nature of the ship. All of us that work on the vessel have a passion for the Amazon and for preserving the forest and the natural environment, and we invite our guests to join the Tucano Team in this important endeavor.